London is one of Europe's largest cities and as a result has one of the most complex public transit systems. Luckily the set up is pretty straight forward, so with just a quick primer on how to get around, you can skip paying for cabs and tube it like a local.There's more than one way to get from A to Z in London, but the most important methods are the Underground (sometimes referred to as the Tube), the public bus network, the Overground, and the Barclay Cycle Hire. Your first order of business is obtaining an Oyster card, London's contact-less payment system that's valid on any of the above methods of transportation with the exception of the cycle hire. You can purchase an Oyster Card from any of the vending machines inside the any tube, and you can pay for your card with British pounds or any major credit cards. The Oyster Card is accepted across all the London platforms making it easy to transfer from tube to bus seamlessly. Using the Oyster Card is easy, you just tap it on the yellow pad to get on, and tap it when you get off (the exception of the bus which you only tap when you enter). The system is based on six fare zones, so tapping off allows them to determine the correct amount to automagically charge you. The zones are marked on the map, but almost everything interesting is in the first zone (the city’s center). REMEMBER: You must touch your Oyster card on the yellow card readers when traveling on London's public transit. A £5 deposit is required to the Oyster Card, and when you're ready to leave London you can return your card and get a refund, or keep it for your next visit. Why deposit £5 to speed up payment on a short stay? It's cheaper. A single zone, one-way cash fare is £4.50 per trip, while an Oyster fare is £2.10, with maximum cap of £8.40. As you can see, you would only need to make a third trip to make it cost effective. It's also really convenient, you don't have to fuss with change or worry about buying tickets, it really is a foreigners best friend. The Underground and Docklands Light Railway (DLR) are the city's fastest method of transportation. It’s clean, safe, and well organized. Not to mention the award winning graphic design that makes up the maps, and easily recognizable logos. Using it is easy, you spot the blue circle with the red intersecting line outside and follow the stairs to the underground station. Just tap the yellow Oyster pad to enter the station and select one of the 11 color-coated lines and follow the signs to your platform. Transfer points are marked with a white dot on the map, and fare zones are drawn in shades of beige. There are signs on the platform that tell you when the next two trains are coming, and where the last stop will be. If the stop on the sign doesn't say your station (i.e. it doesn't go to your stop) just wait for the next one, not every train goes to the same stations. INSIDER TIP: Most stations are down long flights of stairs, so think twice about packing that extra piece of luggage. Hours of operation are Monday to Saturday, 5am - 12:30am, and Sunday 7:30am -11:30pm. Early, right? Don’t worry. If you arrive late or stay out past bedtime, popular bus routes cover the major lines and come around outside the station every half-hour, we cover that in the section below. 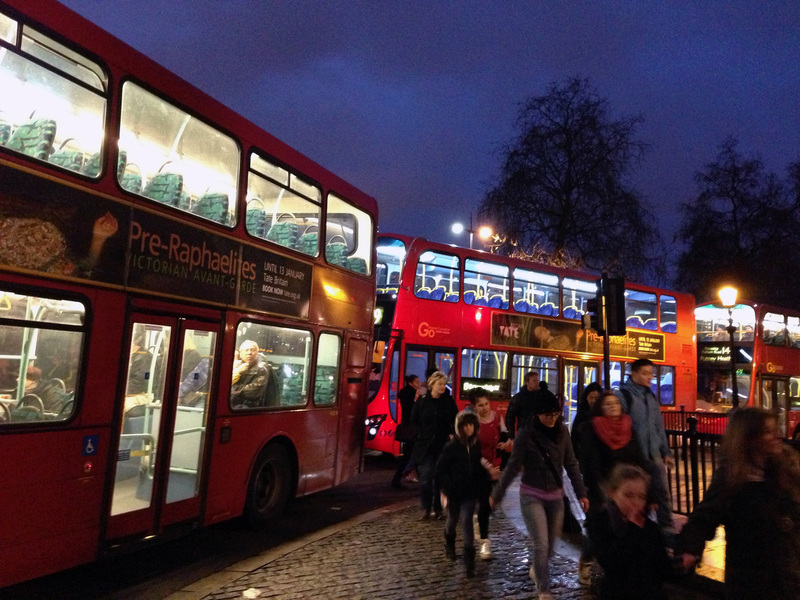 London has one of the most straightforward, easy to navigate bus systems in the world. Stops are clearly marked with a symbol similar to the underground, followed by the bus route numbers that service the stop. London is famous for its iconic red double-decker buses which are still in use today. Different from the underground, when using the bus you only tap your Oyster Card once when you enter the bus, which will charge you for the trip. When a big red double-decker bus pulls up if you have an Oyster Card you can enter at any of the three doors as each doorway has a yellow payment pad. Stops are announced (and printed on an electronic sign at the front) so you'll won't miss your stop. The whole bus is monitored by the driver by CCTV meaning the driver can see what's happening in every inch of that huge bus, making them fairly safe. The bus system is cheaper than the Tube at £1.40 for a one-way oyster ticket, and has a daily cap of £4.40. If you want to pay cash you'll have to pony up £2.40 per ride and the tickets need to be purchased before entering the bus. Most stops have a ticket machine that you can purchase paper tickets at, but do yourself a favor and just get the Oyster Card, it's so much easier. Most routes run from 5am to Midnight, but many popular routes are 24 hours. When the Tube closes, night buses kick in and those routes are prefixed with an N. This is a great option if the Tube closes early for repairs (as it often does), if your flight gets in late/early, or you lost track of the clock while you were out partying (something else that happens often). Despite what most Londoners will tell you, the night busses are safe, and mostly occupied by shift workers and loud, but totally harmless party goers. Almost all stops at major intersections have maps of the routes. If you have a specific schedule in mind, you might want to do some mapping recon on the Transport For London website. The Barclay’s Cycle Hire is a bike rental system, much like the Velib in Paris or Citi Bike in New York, and is an excellent (and green) way to get around the city for short trips. Go to your nearest docking station and follow the on screen prompts to receive your cycle release code. Find a bike at the nearby dock, make sure it's in good working condition, enter the release code and voila you've got a bike! When you're done with the bike you'll need to return it to any of the city docking stations to end the charge on that rental. No membership is requrired for Barclay's Cycle Hire, instead all rentals are are charged to your credit card at £2 access per day (once a daily), then you can borrow a bike anytime that day and you'll be charged a sliding scale fee based on the length of time you keep the bike out. The system is designed to encourage short term usage, so the first 30 minutes are free, regardless of how many trips you take. So in theory, if you return the bike every 30 minutes you could use the bike several times and only pay the daily fee of £2. Longer trips of course, are less affordable with the price increasing by the amount of access time. After 30 minutes up to 1 hour is £1 and increases to £50 pounds a 24 hour period. If you don’t return the bike or damage it, a £300 fee is charged to your card. With this in mind do plan on completing your trips as quickly as possible, and make sure your bike is securely docked before you leave it alone (make sure you see the green light comes on), otherwise you could be on the hook for the service fee. And with any great city, walking is still the best way to experience London's fantastic culture, quirks and all.